The original 300 was an unexpected success, so perhaps we should not be surprised that the producers would manage to come up with a sequel to a film where every main character died, even if it took 7 years. Technically, 300: Rise of an Empire is a “sidequel,” telling the origin of Persian leader Xerxes and a wraparound story of Athens’ plight during the Second Persian Invasion in Greece. While not as stylistically dynamic as Snyder’s film, Noam Murro does an admirable job helming, keeping the film roughly within the same visual range as the original. 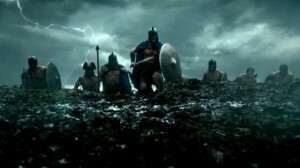 The film opens with a prologue depicting Themistocles (Sullivan Stapleton) thwarting the Persian King Darius’ first invasion of Greece at Marathon and the rise of Xerxes (Rodrigo Santoro) under the influence of Artemisia (Eva Green). The main bulk of the story depicts the preparations for war, the building of the alliance of Greeks, and the battle of Artemisium, a naval battle that happens roughly concurrently with the Battle of Theremopylae. 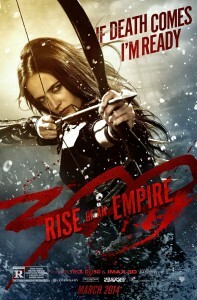 The biggest difference between Rise of an Empire and the original film is that of a charismatic antagonist. Eva Green lets loose as Artemisia I of Caria, the only female commander of the Persian navy (I was surprised to learn this all comes from Herodotus). She goes beyond pure scenery chewing and manages to take over the entire film. It’s easily one of the best over-the-top villainous performances in recent memory, perfectly fitting with the film’s indulgent use of severed body parts, poetic one-liners, and slow motion. She alone is reason enough to see this film. Sadly, Sullivan Stapleton is not anywhere near engaging to watch. It’s not a compliment comparing him unfavorably to Gerard Butler, but here we are. I am not sure I ever truly cared about King Leonidas, especially knowing his fate is sealed, but I was at least entertained by him. He’s just a pretty torso with a British accent. Even Artemisia is underwhelmed by his personality in a certain scene. His performance is serviceable however, so the only real disappointment is that the character designs overall were much less fantastical than the original. Ultimately, I realize that 300 (both the film and the original graphic novel by Frank Miller) are controversial for their political overtones. If that bothered you in the first film, I am not sure that Rise of an Empire is going to fair much better, but I don’t remember any standout lines of dialogue. However, it’s hard for me to begrudge a film that is just so relentlessly watchable. After seeing this film, I rewatched the first film for the first time in several years and found it completely engrossing. The flat style of Miller’s artwork is perfectly suited for 3D on top of it, making for sublime late night viewing. This isn’t Sparta, but it’s the next closest thing. Despite all of the similarities, most of the action in this film takes place on the sea, giving the film a distinct backdrop for all of the limb separating. Ships ramming into each other adds a whole new level of carnage, with splinters spilling out of the frame, but the film makes sure to fill us in on the strategy repeatedly, which helps explain what our Greek heroes are trying to accomplish other than “not die.” Splitting its attention gives the film a broad scope, especially when the focus of the first film worked to its advantage, but the filmmakers seem to recognize that, as everything but Artemisia and Themistocles falls away by the climax. We definitely did not need a second 300 film, and I would have said one should only be made with Zack Snyder at the helm (still his most coherent film), but Noam Murro’s directing lends this film to a Certified Copy-esque exercise in which the copy is so good it is nearly indistinguishable from the original while watching it. In fact, I would actually watch a four hour intercut of these two films, if only to see how they compare (in 3D!). These films are schlock cinema elevated with graphic novel and video game influences, and it’s hard not to get caught up in how it revels in its own ridiculousness. 300: Rise of an Empire opens today in Philly area theaters.